The body is buff burning Plainsman M340 (cone 6). The amber colored glaze is 80% Alberta Slip (raw:calcine mix) with 20% of each frit. The white engobe on the inside of mug 1 is L3954A (also glazed inside using transparent G2926B). These frits are producing an amber gloss glaze of high quality. On the outside of mug 1 we see the 3195 version on the white slip until midway down, then on the bare buff clay (the other has the 3249 version). 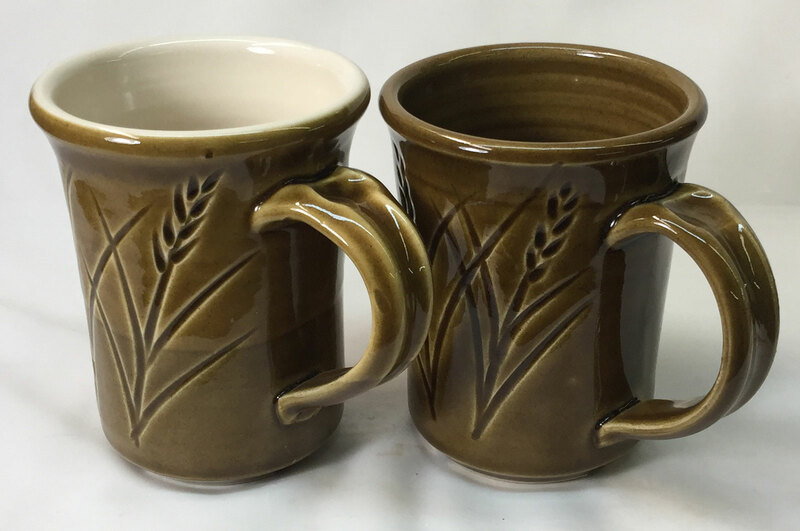 These mugs are fired using a drop-and-soak firing schedule. There is a caution: Frit 3249 has a very low thermal expansion, use it on bodies that craze other glazes (like Plainsman P300), it could shiver on stonewares like this.